Currently I, with the help of my clever and creative daughter, am preparing the graphics and text for my new advertising campaign. A local preservationist group, Restore Oregon, has offered to allow me to advertise in this year's tour guides. They will have two self guided tours this year, both are featuring homes in the Mid-Century Modern style. I knew without hesitation that I wanted to take advantage of the opportunity be an advertising sponsor of this year's tours. For the same reasons that I love my work I am very sympathetic to Restore Oregon's drive to preserve the at risk older structures in our area. Aside from that, the timing is perfect for me because I am endeavoring at this time to forsake general plumbing repair and turn my attention exclusively toward the repair and restoration of vintage plumbing fixtures. Collaborating on creative work requires not only the knowledge of what one desires to create but the ability to express how and why one would use the designs and language proposed. For my part, I had several ideas about what I would want to do and say. My daughter is doing a good job of keeping me grounded, helping to keep it simple, balanced, relevant, and meaningful from the layman's perspective. my 1897 L. Wolff Mfg. Co. catalog. We are so pleased with the result so far that it will become the pattern for the next batch of business cards. During the first phase she and I had several preparatory talks and at last one long creative session to agree upon the main elements of the primary graphic that will go on Restore Oregon's website. She then produced nine mock-ups and we selected the best elements from the lot. After that I wrote the text for the accompanying promotion. Yet to create is the material to fill the space I have been given in the tour guides. A good deal of research goes into the work of creating a design that will convey a message. The fact that I have been giving new life to fixtures from the thirties, forties, fifties, and sixties for many years is not enough. I needed to know what the term Mid-Century Modern means, not only to me and not only to others, but what the usual range of meanings are because these things can be somewhat controversial and I am not interested in taking a stand but in communicating at large. I was intrigued to see that the colors I am familiar with in the fixtures of the period were repeated in design and advertising. I learned not only the origin of the term Mid-Century Modern but that it and indeed most of the terms used to describe periods in design came well after the end of the period in question. I searched and read through a good deal of material, the consequence of which is a whole new appreciation of the period. I no longer see Mid-Century Modern only as it relates to my work but to furnishing, architecture, art, and even open spaces and life style. "It feels refreshing to think about what, to me, were good and positive times." I was born in 1950 and grew up in the suburbs of Long Island, New York. I have an old familiarity with the colors and forms we are working with on this project. Formerly when I perused my old manufacturer catalogs I would focus on the fixtures, remembering which I had worked on and who I had done the work for. Now it seems as though my reminiscences have really come alive. I can't help but think of the bright colorful advertisements for the refreshments available at the concession building before they began to play the Tom and Jerry cartoons at our local drive-in theater. I think about what it was like inside the Cape Cod style house we lived in, the floors and counter tops, the tables and chairs. It feels refreshing to think about what, to me, were good and positive times. RestoreOregon Mid-Century Modern Home Tour Advertisement. The image comes from an old Standard catalog. Perhaps the enjoyment I feel when I work on the fixtures of that period is not simply because the work is easier. I know that the styles and forms speak to me artistically but what I had not considered is that I probably associate those fixtures with pleasant memories. Is is easier to work on the fixtures from those decades than it is to restore fixture from near the turn of the century. The parts are easier to attain and the valves were meant to be repaired with parts that could be easily replaced. While the porcelain on cast iron was about the same grade of product as it had always been, the vitreous china ware was much better material. You never see the crazing in it that is so common with the older stuff and because of that it seems more sanitary. Mid-Century Modern plumbing fixtures are also plentiful. There are many to be had and many remain in their original settings. I am particularly fond of the wall hung lavatories that were set with stainless steel legs in front, what we call Leg Lavs. 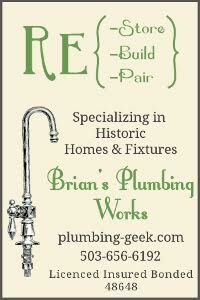 I have been able to acquire various fixtures, faucets, and sets of hardware from the period that are "New old stock". I have sets of lavatory legs, some with integral towel bars along with faucets by Crane and Standard. I'm hoping the new advertising will help me find more work on Mid-Century fixtures and help me find homes for some of the new and used stock I have to offer.